CAEE green building policies encourage the construction of energy efficient buildings across the province, such as the public library in Saanich, which was designed to achieve a LEED® Silver rating. Community Action on Energy and Emissions (CAEE) offered financial and research support to BC local governments and First Nations to advance energy efficiency, energy conservation and emissions reduction through policy and planning tools. The program, administered by FBC between 2005 and 2010, was funded by the Province of BC, BC Hydro, Fortis and the Community Energy Association of BC. FBC congratulates the 54 BC communities that participated in CAEE, for their innovation and inspiration. See our synopsis chart CAEE projects at a glance, then read on for details. Existing industrial, commercial and institutional buildings. Here’s a summary of projects: First Nations Communities | Local Government. This First Nation community prepared a community energy plan as part of its comprehensive community planning process. The community completed a basic energy profile and carbon footprint assessment for the Band and began an evaluation of suitable alternative/clean energy technologies. The Coldwater Indian Band completed energy audits of civic buildings and designed a new administration complex building according to green building standards. They also investigated the preparation of a community energy plan and incorporated energy policies into comprehensive planning processes. The Ktunaxa First Nation prepared an energy conservation toolbox for new subdivisions and new institutional buildings, completed audits on Band and Nation buildings, and began visioning for a community energy plan. MTTC conducted feasibility studies for alternative energy sources. It developed a community action plan and initiated an outreach program focused on reducing dependency on diesel and fossil fuels. Seabird Island prepared a community sustainability action plan and completed research on renewable energy options. The Band also prepared a strategy to communicate ways to reduce energy consumption within the community, which will be complemented by information on renewable energy. T’sou-ke First Nation developed a toolkit on renewable energy project implementation for off-grid First Nations communities. It also hosted a Solar Gathering and Forum and fostered a network of first nations communities working on renewable energy. Over 500 people attended the Solar Gathering and Forum and toured T’sou-ke’s large solar energy system. The West Moberly First Nation studied renewable energy sources, including biomass, geothermal, and wind energy, and initiated residential and community building audits. West Moberly prepared an energy consumption baseline and a community energy plan. 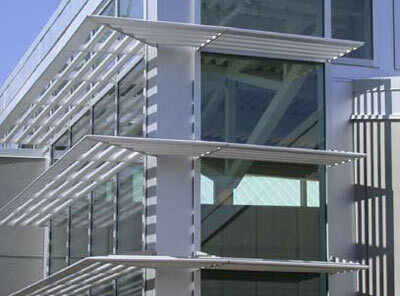 Abbotsford developed green building guidelines and a green building policy for municipal buildings. Burnaby added green building guidelines for comprehensive development zones for multi-family wood frame buildings to the Official Community Plan and developed an education program for the public and for staff. Campbell River completed energy audits on city-owned buildings, reviewed city policies to explore the inclusion of policies for energy efficiency, and developed an energy efficiency checklist for developments that require a development permit or rezoning. Colwood implemented energy efficiency measures for civic operations. For example, the City joined the Fraser Basin Council’s E3 fleet program and participated in a Green Buildings BC assessment. The City also included energy efficiency policies in the Official Community Plan, developed a new rezoning policy, electric vehicle bylaw and bicycle parking bylaw, revised development permit areas, and developed a sustainability checklist. Dawson Creek developed an energy efficiency and solar ready standard for single family homes and researched the feasibility of solar energy in the commercial sector, especially hotels. They also encouraged commercial building owners to join the Building Owners and Managers Association’s (BOMA) Go Green program and added value to the program by providing solar hot water assessments to complement the BOMA energy audits. Fernie completed a greenhouse gas inventory for both civic operations and the community as a whole. Draft greenhouse gas reduction targets have been established and initial steps have been taken to develop a greenhouse gas action plan. Fort St. John looked for opportunities to develop enabling language for energy efficiency within the Official Community Plan and reviewed other bylaws to determine if there were opportunities to add requirements or voluntary measures for energy efficiency. The City also explored design guidelines for geo-exchange systems for single and multi-family residential and commercial development. Kamloops developed an integrated greenhouse gas, energy and air quality plan that included recommendations for City facilities and operations as well as the broader community. Kelowna reviewed municipal procedures affecting energy efficiency for new buildings, then merged them with practices for the development of sustainable buildings. The findings were summarized into a sustainable building primer which can help other communities define their own policies to create sustainable buildings. An energy efficiency building checklist was also developed. Kimberley prepared a greenhouse gas action plan based on a greenhouse gas inventory, established reduction targets, and prepared an implementation plan. Merritt City Council adopted a policy authorizing staff efforts to advance energy efficiency for the community, providing them with latitude to pursue a broad range of energy efficiency initiatives. Merritt reviewed its Official Community Plan to identify ways to strengthen energy efficiency policies, created incentives for EnerGuide for New Houses building labeling, and reviewed the zoning bylaw. The City of Nelson developed a greenhouse gas action plan. The City prepared a corporate greenhouse gas inventory, joined the E3 Fleet program, and investigated various green building audit programs and district energy options. New Westminster developed a strategy to improve the efficiency of municipal buildings, and undertook five retrofit projects under the guidance of a newly formed Energy Management Committee. The City set energy efficiency targets for single and multi-family residential homes, hired a community energy manager, and developed incentives to encourage energy efficient buildings (e.g., rebates on building permit fees, design assistance and free audits). The City also undertook research on the development of a roadmap for municipalities that wish to impose more stringent energy efficiency requirements in their building bylaws and completed a feasibility study for the connection of existing low-rise apartments into the Lonsdale district energy system. Prince George developed a draft green building plan that is integrated with the Federation of Canadian Municipalities Partners for Climate Protection program and with the City’s energy and greenhouse gas plan. As a parallel project, the City developed an integrated community sustainability plan to address broader aspects of sustainability. In its CAEE Gold project, the City created a rebate program to encourage construction of homes to EnerGuide 80 and 82 standards. At the same time, a rebate was offered to home sellers for completing a home energy audit and publicizing their achieved EnerGuide rating. Council convened a 15-member volunteer task force that organized a number of community consultations and worked in cooperation with the Sheltair Group to prepare a community energy plan. The community energy plan outlines greenhouse gas reduction strategies, targets, and implementation recommendations. City Council adopted the plan and committed to its implementation. Port Moody hosted public forums targeting multi-family strata councils and commercial and institutional building owners, and developed an energy efficient checklist for new development. The City also developed a greenhouse gas/energy/air quality plan, along with an updated Official Community Plan. Quesnel partnered with BC Hydro and Terasen (now Fortis) Gas to hire an energy coordinator to help promote energy efficient home designs and retrofit 20 homes and several commercial and institutional buildings for increased energy efficiency. Surrey drafted a community energy plan for the City Centre. It contains best practices for land use, building, and infrastructure design. The City also conducted a workshop with staff, developers, builders, and consultants to provide energy efficiency information and seek feedback from industry. In its CAEE Gold project, the City identified options for a Surrey City Centre district heating/sewer heat recovery system through a series of background papers and policy frameworks. Vancouver pursued regulatory changes to the Vancouver Building Bylaw and investigated the use of local improvement charges to finance energy efficiency upgrades in existing multi-family residential buildings. The City of Victoria developed a green building policy for both public and private sector buildings, supported by a website on green building requirements. Delta undertook a comprehensive bylaw review to identify energy efficiency opportunities and potential barriers, including a review of the zoning bylaw, subdivision and development standards bylaw, and building and plumbing bylaw. Recommendations for policy and bylaw amendments to encourage greater energy efficiencies in land development processes were also identified. A second project created eco-industrial Development Permit (DP) guidelines to conserve energy and reduce GHG emissions for Zone C development in Delta. The District reviewed both its Official Community Plan and its subdivision servicing bylaw for energy efficiency policies and requirements. The District also completed a greenhouse gas inventory, identified energy efficiency opportunities, established performance measures for buildings, and developed a green building policy and checklist. Central Saanich established energy efficiency targets for new single family and row house buildings and investigated the potential for building labelling requirements. Energy efficiency language was developed for the Official Community Plan and an energy efficiency checklist was prepared for residential development. A Community Energy Plan was developed. The District initiated a community energy planning process and started work with SmartGrowth BC to update the Official Community Plan, so that policy statements include climate change mitigation goals. The CAEE initiatives supported work in the community, including implementation of a geothermal heating system into the fire hall expansion and investigation of the feasibility of geothermal energy for other community buildings. Houston added energy efficiency language to its Official Community Plan and worked with communities within the region (e.g., Smithers, Terrace) to support energy efficiency objectives region-wide. Houston was the first local government in Canada to mandate fuel efficiency for solid fuel burning appliances and the removal of non-efficient appliances by 2010. The District also investigated the development of a district heating system, based upon key city facilities. The District worked on a new Official Community Plan and a climate change action plan. A green building strategy was to complement these initiatives, to include: an overarching policy statement; a developer checklist for Part 3 and Part 9 buildings; amendments to zoning, building and other applicable bylaws to remove impediments to energy efficiency and other green building measures; and consideration of developer incentives. The District established a private sector green building policy, which included a builder recognition program and rebates of up to 30 percent on building permit fees for new dwellings that meet Built Green™ Gold, EnerGuide 80 or R2000. The District also developed energy efficiency guidelines for development permit areas and offered free energy advice to homeowners. The District developed a community energy action plan based on climate neutral targets. The plan includes policy statements for the Official Community Plan and downtown neighbourhood plan, and policies and tools for three catalyst projects — the ”sustainability block", a district energy system, and a multi-modal transportation hub. The District also developed policies to support energy efficiency in new and municipal buildings and developed a green building web toolkit. It continued to work on collaborative policies for existing buildings, including green building checklists. 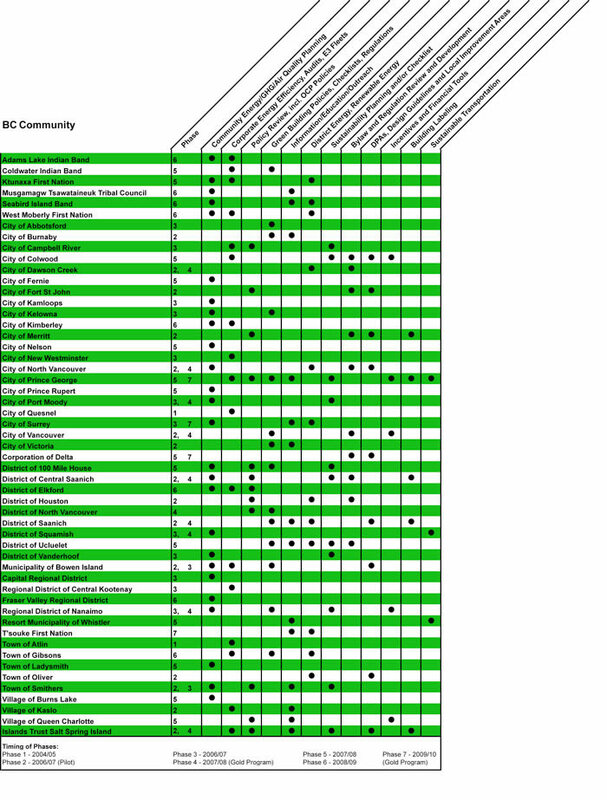 With the help of a new online community portal (www.wiki.ucluelet.ca), Ucluelet identified amendments to the zoning bylaw to include green building mechanisms and, as part of the Official Community Plan review process. The District also held an "energy day," where experts on energy efficiency, electrical cars, and wave energy were available for questions. Ucluelet prepared a green building guide and permit checklist in consultation with the local building industry and began to implement items outlined in the newly adopted "working action plan" that was created to reduce corporate carbon dioxide emissions. Staff and Council investigated the possibility of electric fleet vehicles and a community wave energy system. Vanderhoof developed an energy efficient standard for municipal buildings and amended existing bylaws for new development. It drafted a community energy plan and a checklist for new development. Bowen Island adopted green building standards for new residential construction (requiring a rezoning), created building and development guidelines, and integrated community energy plan options into a broader community planning framework. The CRD built connections between the region’s community energy plan and the policy initiatives of each of the four CAEE participants within the Capital Region: Salt Spring Island, Saanich, Central Saanich, and Victoria. Central Kootenay completed an energy inventory and efficiency plan for 14 district fire halls and three recreational facilities. It also initiated an E3 corporate fleet analysis in conjunction with the City of Nelson. The FVRD updated its air quality management plan to include greenhouse gas emissions and mitigation measures. In addition, the Regional District joined the Fraser Basin Council's E3 Fleet program. Salt Spring Island developed a sustainability checklist and researched a density bonus regulation that would permit a larger residential building footprint if the building were constructed with higher energy performance standards. It also included energy efficiency objectives in the Official Community Plan, explored revised development permit area guidelines for energy efficiency measures, explored ways to require building labelling, increased residential density and mixed use in Ganges Village, and organized citizen outreach efforts. The Nanaimo Regional District developed a community climate change plan, a sustainability checklist and a green building policy for corporate buildings. It also researched geothermal energy systems for the an aquatic centre. Whistler developed an online carbon calculator (www.whistler.com/ecopath), which provides visitors with tools to offset their travel greenhouse gas emissions. One of the very first participants of the program, Atlin developed and launched new energy efficiency programs in the fall of 2005. Gibsons initiated the detailed design and construction of a municipally operated district ground source heating utility (geo-utility), which will capture ground source renewable energy at a town-owned park site and waste heat from nearby recreation facilities. The energy will be used to heat residential and commercial structures. Ladysmith prepared a community energy plan and engaged the community in a sustainable development visioning process. The town also established an Environmental Commission and trained staff to implement the town’s vision of sustainability. Oliver developed energy efficiency language for the Official Community Plan, including updated development permit area guidelines, and evaluated the cost efficiency of a geo-exchange system for the new wine village. Smithers developed an energy efficiency checklist to inform builders and developers about green building policies. The town also developed a community energy plan and updated the Official Community Plan to include greenhouse gas reduction actions. Burns Lake prepared a community energy plan informed by the input of a community advisory committee. Kaslo held a very successful energy efficiency trade show in cooperation with Fortis BC and drafted energy efficiency language for the Official Community Plan. Queen Charlotte developed a community electricity plan, incorporated energy efficiency and emission reductions language into the Official Community Plan, held a Sustainability Fair and researched possible incentives to encourage households to complete EcoEnergy audits. 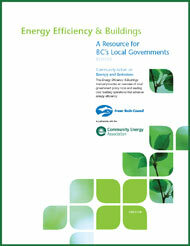 Energy Efficiency & Buildings is a helpful resource for BC communities that want to improve energy efficiency and reduce greenhouse gas emissions. Published by FBC in 2009, the manual covers energy codes, energy rating and labelling for buildings and equipment, energy management for civic building and operations, and policy tools to advance energy efficiency in private sector developments. There are case study examples, coupled with insights from BC civic planners and managers. Take a look!